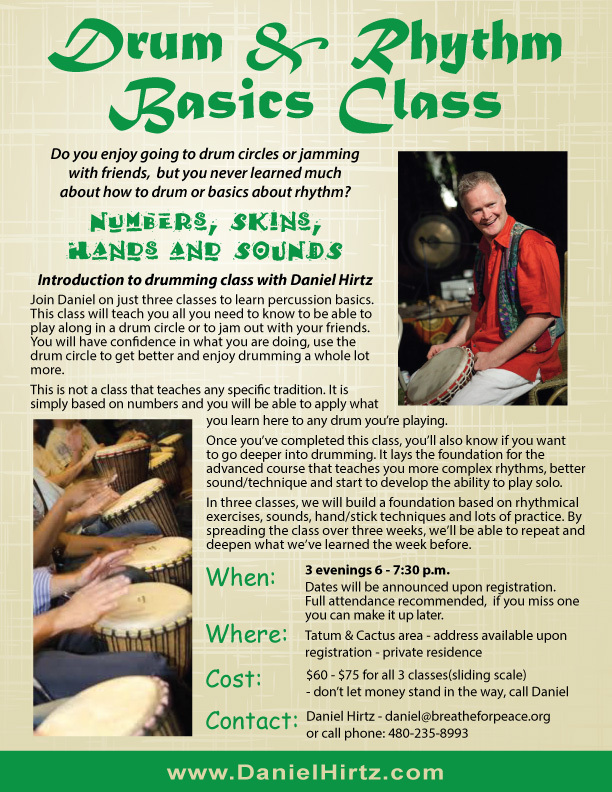 Join Daniel for the Drum and Rhythm Basics Class! In just three classes learn percussion basics that will get you on the right path to drumming. This class will teach you all you need to know to be able to play along in a drum circle, have confidence in what you are doing, use the drum circle to get better and enjoy drumming a whole lot more. This is not a class that teaches any specific tradition. It is simply based on numbers and you will be able to apply what you learn here to any drum you’re playing. Once you’ve completed this class, you’ll also know if you want to go deeper into drumming. It lays the foundation for the advanced course that teaches you more complex rhythms, better sound/technique and start to develop the ability to play solo. In three classes, we will build a foundation based on rhythmical exercises, sounds, hand/stick techniques and lots of practice. By spreading the class over three weeks, we’ll be able to repeat and deepen what we’ve learned the week before. WHEN: 3 evenings 6 to 7:30 (probably running a little longer).. Please click here to go to our Drumming Sounds Meetup page – look for the upcoming: “Drum and Rhythm Basics with Daniel Hirtz – Thursday evening” page and register for this class. Thanks. I came to this class feeling entirely rhythmless and intimidated. Daniel draws you in, gets you comfortable, and then alters your reality. After having completed the basic drumming class, I’ll say that Daniel blows my mind with his skill and insight, but more importantly, I blew my mind with the realization of what I’m capable of. He’s a true teacher. There were moments during those classes when I could feel the synapses firing in my brain. It was a most enjoyable experience. I’d do it again in a heartbeat! Thanks, Shaundra, it was great having you in the class… come back and jam with us! Daniel’s expertise far surpasses just Drumming. Notice I capitalized the word Drumming because it is an elemental constant, a resonance which reverberates beyond Music. Enjoying the Drum and Rhythm Basics class has enriched our friendship and brought us closer into the heartbeat of Human Life. I would recommend this class to just about anyone at anytime. The benefits are numerous, with many subtle truths that become evident through the Magic of the Drum. This is so much more than a drumming class. I am able to further understand the history and importance of the drum within the community. By practicing in Daniel’s small group, I feel more confident in myself, to keep a rhythm with intention, and in connection with those who drum with me. I appreciate your light, Daniel. Teachers like Daniel, with years of practice beneath their belts, make complicated drumming rhythms seem like child’s play. But therein lies the key to his awesome classes – DRUMMING IS FUN! And when you combine learning to play drums with the expertise of a master teacher like Daniel, you’re straight on your way to MAGIC. Daniel not only shares rhythms and how-to’s, but expertise and knowledge developed from years of experience. From the self-conscious beginner to those already practicing, Daniel enthusiastically gathers everyone under his wing and leads the way. No experience? – No drum? – No problem! Daniel will loan you a drum, show you how to start, and how to immediately fit right in with the group. Besides fun and stress relief, drumming also provides cognitive and relaxation benefits that extend far beyond the weekly sessions. It’s also really nice to meet up with others practicing their skills. With no obligation and an outstanding teacher, these sessions always deliver. I HIGHLY recommend giving them a try! I took the course this fall (2016). This course provided much more than I expected. Daniel gives you a great perspective on what drumming can be. He grounds you in the basics but also paints the vision of what the potential is mentally, emotionally, and spiritually. Daniel is an amazingly skilled drummer and teacher. He is able to attune to each person’s skill level in a group setting and skillfully adjusts his mode of teaching to the levels of all participants. Very fun class! Highly recommended. I took the beginner class a couple years ago and recently took it again for a refresher.. i plan to start the pattern class . Daniel makes the classes fun and thought provoking .. I think drumming could help heal the world!.. come see for yourself!..Lisa B.
I love Daniel’s basic drumming class. Thank you Daniel for sharing and teaching your gifts with us. I have never drummed before until I met you. I have learned so much. Thank you Daniel for a wonderful class. If you have any interest at all in drumming, or you want a refresher . . . Take this Class!!! In my opinion, Daniel’s class is an awaking to how appreciate drumming, and music in general. 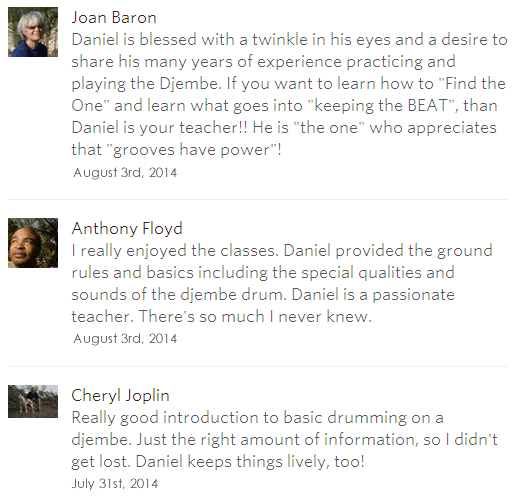 Daniel’s effort goes beyond teaching an introduction to djembe. He shares from his heart, all his passions and experiences in percussion, and life. Great inspiring teacher at all levels. As a music newbie, this was the perfect introduction to drumming and music. I felt at ease in the group, and specially enjoyed how Daniel weaves in the importance of connection with each other as we drum. If you’re curious about drum circles and want to get a solid foundation in drumming, take this class! Great beginner class what I loved going and drilling a basic beat into my head and then counting to that till I could retrain myself into playing more complex beats. If you are considering taking this class from Daniel, don’t hesitate — sign up and enjoy it! Daniel’s energy and warmth supports you every step of the way and you will feel at ease no matter what your starting point is. You will feel amazing good vibes within the group and extend the positivity through easy and powerful drum sounds. It isn’t about the technique, it’s about joy and sharing. Daniel explains all of the roots of this connection and more. He is a wonderful teacher! The three-session beginners’ class was better than I thought it would be. You learn so much more than drumming! You learn to love drumming. Daniel is knowledgeable and kind, funny and helpful. You will learn about rhythm and groove, beat and phrasing. He lends you a drum if you don’t have one, and in just three weeks I began to listen to music differently. Daniel has a great sense of humor and an easy style that makes non-musicians feel comfortable. He welcomes you into the circle of those who know how and want to learn how to drum. Thanks Quinn for your very articulate feedback. I really appreciate it! Never drummed before; it intrigues me! I am drum-less. Does one have to provide ones own drum?! fun learning experience even for the slowest pupil. So don’t worry, jump in and you will love it! Daniel has a special talent for the drums and for helping you get something meaningful out of drumming regardless of your skill. This 3 week series is a great introduction and by the end you will feel comfortable joining others. That’s when It gets fun! I really enjoyed the drum & rhythm basics class. I learned much more than I expected, most importantly about the sense of connection through the beats. Daniel is a fabulous teacher and his love of the art of drumming is truly inspiring! I really enjoyed Daniel’s three Drum & Rhythm Basics classes. I like his approach engaging heart and head as well as hand. I appreciate his knowledge and passion. Banging on a drum with a group of very nice people, I felt myself buoyant and beginning to connect to all of life energy. Thank you for this exploration of rhythm and non-computer connection! The beginners class is what it started from ….. had a great experience and will continue to gain as much knowledge as I can Sir …. Thanks a lot Sir. I have just completed Daniel’s Basics class. I can recommend it with confidence. Daniel is supportive to everyone and is tuned in to their needs. He shares from his wealth of knowledge with passion and ensures that his classes are structured and everyone learns and has fun at the same time. This class changed my life. It’s about a lot more than drumming; it’s about connecting to yourself and others on a profound level. Daniel is a gift: a passionate, wise and loving teacher. Daniel offers a great beginners class in a comfortable setting. He goes in depth into techniques and rhythms that’s very approachable. Perfect intro to begin drumming for drum circles. Daniel offers much more than drumming as he helps connect where the rhythm comes from to what is played. This three-part class is a great intro and works well for experienced drummers too! Thanks Daniel for putting together the “Basics” class. Your home was a comfortable setting, your instruction laid a strong foundation and by the end the group gelled and we were able to get a groove on. Thanks again! I hope to continue meeting up with you some more. Kind, patient, knowledgeable and inspiring! wanting to try drumming for a long time, i’ve taken daniel’s basic drumming classes one and two, far exceeding my expectations. daniel’s joy is contagious, as he weaves the divine into his impressive skills and teaching. looking forward to more!! Daniel is the Bob Ross of drumming. He is enthusiastic and teaches in such a positive way. He teaches the basics and foundation. It is so fun! I will continue. I got so much more than drumming from this class. Connection, Real people, and true joy. I will be back for more. Loved Daniel’s class, each class really built upon the prior one. All the students are from all walks of life, and all have been very fun and friendly. I feel like I have basics now that I needed for the drum circles I attend. Try it, you’ll be glad you did! I finally took the first step and acted on my desire to learn drumming and connect with a drum circle. I am glad to have found Daniel’s basic instructional class on the Djembe drum. I felt right at home with other beginners and learned so much in a short period of time about, beat, time, and coordination. I am excited about continuing with the drum circle in the intermediate drum class and hopefully playing for audiences with the group. Yes, Daniel teaches drum rhythms for body, mind and soul! I loved the class and am looking continuing the journey of returning to the ONE and exploring the beat. I’ve been brainlessly drumming for years and thinking, “One day I’m gonna buy a drum and take lessons.” I had a dream about myself with drums strapped to my waist, and bells around my wrists and ankles! Well, this year I’m finally pursing that goal. Daniel helped me fill in the missing piece: FIND THE ONE! He also helps you learn to transition from one rhythm to the other. I can now close my eyes and feel the beat, as well as play it! If you love drumming, and have procastinated on taking lessons like me, jump into this one with mind, body and soul! Just completed the basics class. I am now addicted! Daniel’s passion and love for the “beat” is truly awe inspiring. A “newbie” such as myself did not feel intimidated by the class, as Daniel ensures that everyone feels comfortable and confident at whatever level they’re at. We very much enjoyed the drumming basics class. Daniel is an interesting, personable, inspiring teacher. The students in our small group had vastly different degrees of musical background, yet everyone grew through his guidance. Recently completed the basics class and am noticing how I am much more comfortable playing drums whenever I see one and how relaxed and excited I am to do so. Really enjoyed Daniels teaching, passion and care. His ability to transmit what he knows based on what I could receive was very helpful in my learning. Daniel is a very committed to both teaching and the art of drumming. I really enjoyed the class and would like to devote more time to learning and being in a circle as my time allows. My journey has begun. Thanks Daniel. The beginner drumming class definitely catapaulted me to the next level! Having been sponsored by my Rabbi Sarah Leah, it gave her confidence in my drumming at services as well as to myself. Daniel theories on making music and ‘being one’ with other drummers in the class and analyzing the counts as well as the primordial elements within the drumbeat was refreshing and something I can grasp and take into my soul for all time. “I love drumming, but I can’t seem to keep up with others.” That’s how I’ve felt for quite some time. It was different with Daniel. No one was left behind. He used multiple techniques–voice and hand clapping to help us tune in to and understand the rhythm. For me, it was going from the known to the unknown. I plan to continue. Daniel’s Drum and Rhythm Basics Class was really and truly fantastic. Daniel is incredibly knowledgeable, highly skilled, and tremendously enthusiastic. I discovered him to be a gentle, funny and inspiring teacher. I have loved percussion for decades. I have participated in several kinds of groups with various styles. Daniel was able to help me understand much more about beats and rhythm… the basics. I have found a new passion for percussion/drumming and look forward to using my new skills in various drum circles and gatherings… soon ! I took the basic drumming course & was inspired to even think of continuing further. I’ve always kind of had a feel for percussion, but never pursued it until now. It was great to connect with Daniel & the other students in a very intimate way & setting. Daniel is a great teacher which helps!